Please allow approximately 3 weeks for manufacturing. This shower curtain is designed and produced by well-known German brand Kleine Wolke, established in 1968, and is backed by their quality guarantee. A luxury, quick dry and easy care polyester fabric as used in many high end hotels. This design has a silky satin appearance. 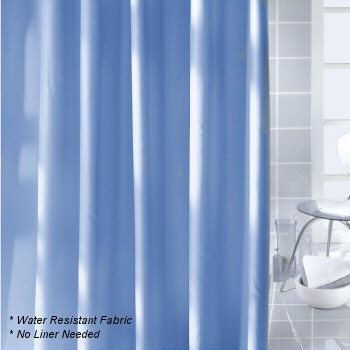 Vita Futura offers the Caravelle non toxic fabric curtain in your choice of white, natural or crocus blue and three sizes shower stall 8 eyelets, tub 12 eyelets or extra wide 16 eyelets. Custom sizes are available. Order above or contact us for details. Custom manufacturing takes approximately 3 weeks from the time your order is approved.